When you think about hotel buffets, you might think that they are all expensive. But you’d be mistaken! Come try the lunch and dinner buffets at The SQUARE Restaurant at Novotel Bangkok Platinum Pratunam and you’ll experience the best credit card promotion for buffet that will definitely surprise you! Every day is devoted to buffet at The SQUARE Restaurant, with a variety of international and Asian specialties created by our skillful chefs for you to try. What makes a meal even more enjoyable? The value of a good ‘50% off’ promotion offered with many leading credit cards such as Citibank, Krungsri, Kasikorn Bank, SCB and Bangkok Bank, of course. With the average cost per diner under THB 1,000 baht, you’ll get your money’s worth and a full stomach to boot. Experience our take on international fare and regional delights such as our renowned roast duck, BBQ pork and crispy pork belly, freshly made pizza and pasta, or authentic Thai dishes every Monday to Saturday during lunch hours at the SQUARE Restaurant. Seafood lovers must try our opulent Sunday Seafood Brunch, offering fresh oysters, New Zealand mussels, Alaskan King Crab, Blue swimmer crab, prawns amongst others. 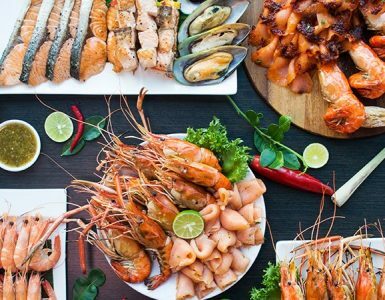 Whether you prefer them on ice, grilled and enjoyed with spicy seafood sauce or as the key ingredient in pizzas, pasta, spicy Thai salads and more, you’ll find a new way to enjoy fresh seafood. To round out a full Sunday brunch experience, our extensive dessert selection featuring homemade cakes, ice cream, traditional Thai desserts and seasonal fruits will bring a smile to any sweets-lover’s face! When it comes to dinner, our Completely Crab dinner buffet promotion lasting through the month of September -October is your chance to relish the full deliciousness of different kinds of crabs in an array of dishes such as steam blue crabs, king crab legs on ice, crab tom yum and many others! 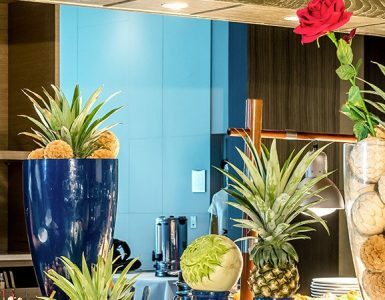 So regardless of whether you are looking for a great lunchtime deal or a savings offer for dinner, with our ‘50% off’ credit card promotion for buffet at Novotel Bangkok Platinum Pratunam, we’re sure you’ll find something just right for your needs!